In spite of the fact that we’ve been here for five years, we are just visitors to this part of the world. Long after we leave, the work in which we have been privileged to have a small part, will go on. There are many at home who have played a significant part, without the joy of knowing personally the people who lives they have invested in. There are many ways in which you have been involved- and you know who you are. Some have financially supported specific individuals or projects, others have covered the work in prayer support and still others have carried the load at home to free us up to be here. The hospitality offered by some in welcoming us into their homes when we needed a place to stay, or offering a listening ear or a voice of encouragement have enabled us to be here. We would so love for you to be able to meet the young people that are doing amazing things for the Lord here, so will try to introduce you to some of them in our posts. Haun Kimsong is a Cambodian that one family back home have financially supported both in his work and his training. 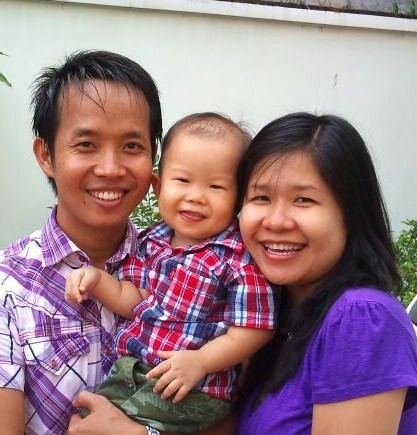 Kimsong is a husband and father of a very sweet little boy, named Canaan and the leader of the Youth team at TWR Cambodia. This team of three, write, voice, produce and distribute a weekly radio program called It’s Yours that addresses issues for youth and provides contact information so youth can receive personal support and follow-up. A leader in his own church, he often preaches there or preaches in other churches as needed. Troubled by the lack of unity between churches, he and a friend have established an interdenominational, youth prayer movement with over 250 young people in Phnom Penh as well as another group now meeting in Siem Reap. They meet monthly to pray for the church and very specific issues that they feel called to address. Kimsong has been a leader in the health program, embraced CHE (Community Health Evangelism) very enthusiastically, has provided translation for us through every training week, and has done a considerable amount of training himself in churches and other community organizations. He has developed friendships and networks of like-minded people and been a real witness among the RHAC staff. A gifted teacher with a very sensitive heart, it is a joy to watch him take a group of youth through a CHE lesson and watch their excitement as they grasp these concepts for the first time. This young man has the potential to impact Cambodia and it is a joy to have had a part in his life and to count him as a friend. We invite you to lift this fine young Christian leader and his family before the Lord in prayer. The future of a better Cambodia is in the hands of people such as this.